"HE LOVES LONG, LOVES HARD, BUT HE DON'T LOVE EASY." Katrina Vega is set on one thing: finishing college. She's determined not to let anything or anyone distract her, especially not hot brooding bikers. On her mission to stay focused, she doesn't expect to be pulled into the fold of a motorcycle club, let alone into the arms of Alec "Mute" Stillwater. Unable to keep her guard up, Katrina soon discovers that beneath the hard and rough exterior of a family she's grown to care for, there's also loyalty and passion she's envious of. But falling for the club's enforcer will not only threaten her plans but quite possibly her life. ML. Nystrom is a new author that I saw on my Kobo recommendations and decided to buy and I'm really glad that I did. This book focuses on Katrina Vega and Alec 'Mute' Stillwater. Katrina is trying to survive life and get through college, what she doesn't expect is a job offer and Mute crashing into her life. This is a complicated relationship, Katrina is a quiet, shy young woman who is trying to protect herself and make herself invisible. 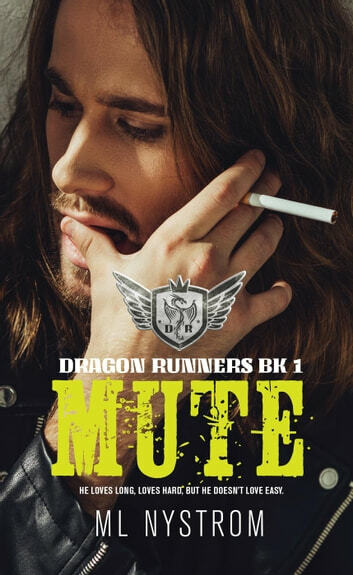 This is in contrast to Mute, a member of the Dragon Runner MC, who has had a hard life which has rendered him unable to speak. He is a tough, hard man and this is seen in the way he thinks about Katrina but pushes her away, thinking her too soft for the life of an MC and for a man like him. Mute is an amazing character and as he can't speak the author writes his dialogue through text or through thought which was really smart. You really get to see how this brooding character thinks, and underneath all the gruff is an amazing character who is really strong. Both Katrina and Mute are amazing characters together and although there are communications problems, self esteem issues etc for them to deal with, they come out strong on the other end. The scene with Mute in the hospital is particularily poigniant. This novel packs a lot of action and we are introduced to new characters throughout the book (I'm hoping there will be books about some of these characters because they are amazing!) as well as the life of the Dragon Runners MC. Even though this is a romance book, there is enough action going on within the MC to keep you hooked on this book. This book is an amazing start to a new series and I can't wait to see what else the author has in store. Very exciting start to a series! For a new author I was pleasantly surprised at how well written Mute was. The storyline was a unique to me when compared to other biker series I have read. The author's style was exciting and her attention to details was very impressive. On top of that, the characters were all well defined and just so darn lovable (well except for the bad guys but I will say even the bad characters were well thought out and perfect for the parts they played). Mute and Kat had been through a lot in their youths and grew into adults determined to not let those times define them. They were both loners to a degree, yet both were strong in their desires to make it. Kat longed to be loved and have a family while Mute struggled to just be understood. 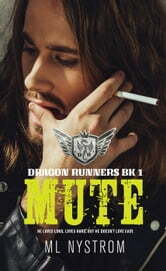 Mute is the Dragon Runners MC enforcer and a bouncer at the club’s bar. He met Kat the night she went to work at the bar and from that night both good and bad sparks flew. (Secretly smiling at that thought) I highly recommend reading this fast paced, action packed storyline that is also very heartwarming. It’s one MC ride you do not want to miss out on. 2 Thumbs Up for a great read and this reader is looking forward to Stud, Book 2 in the Dragon Runners MC Series. An engaging and entertaining author. I can't wait for the next book. I loved this beautiful story.